The RDC-Flex Rotary Die Cutter is the latest addition to the line of digital finishing equipment technologies offered by THERM-O-TYPE. 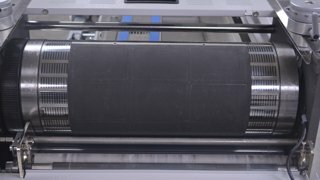 RDC-Flex rotary die cutting equipment has been specifically designed for digital printing plants that require high quality output, automated stripping and very fast format changeover. The combination of large die cut area, throughput speed, fast set up, automated stripping and ease of operation make the RDC-Flex rotary die cutter with flexible steel rule rotary cutting dies an important production machine in any digital printing plant. The RDC-Flex rotary die cutter can die cut up to 4,000 sheets per hour. Intricate shapes and designs can be produced on a rotary die cutter, with flexible dies, that would be impossible to produce with a steel rule die/platen press. RDC-Flex rotary die cutting equipment can kiss cut pressure sensitive stocks up to 4,000 sheets per hour. Combination die cutting/kiss cutting can also be produced using a flexible die specifically manufactured for this application. The RDC-Flex can rotary die cut and multi-score sheets (video) up to 4,000 sheets per hour. The “multi-score” is a patented technology that kiss cuts three, closely spaced parallel lines to create a “score”. Applying a multi-score does not require the use of a traditional scoring matrix or a “matrix die” on a lower magnetic cylinder. Like a traditional score, a multi-score is used to accurately define a fold line and to eliminate paper cracking at the fold. The RDC-Flex rotary die cutter uses flexible rotary cutting dies which are mounted on a magnetic cylinder. Flexible rotary die cutting dies are ideal for intricate die cut designs and can be used for die cutting, kiss cutting, combination die cut/kiss cut and die cut with “multi-score”, for folded products. 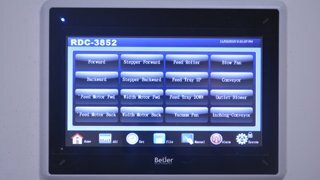 The RDC-Flex rotary die cutter uses a full color touch screen control to simply set up and operation. Machine speed, vertical and horizontal registration adjustment, feed start/stop, count functions, batch count functions, batch/surge delivery, edge or mark registration mode selection, jam detect/interrupt, programmable waste ejection fingers, and program storage and retrieval functions are all controlled, displayed and adjusted using the touch screen control panel. The RDC-Flex feeder can support a 15.75” stack of paper. The “vacuum belt” style feeder feature include; lead edge and tail edge blowers with individual air flow controls to float sheets in the stack, micro sheet thickness adjustment to restrict double feeding, quick set side and tail sheet supports, pile height adjustment and double sheet detect/interlock. The RDC-Flex rotary die cutter uses a full-length paper alignment table to accurately position the side lay of each sheet. Side-to-side registration is controlled and adjusted through the touch screen control with a precision stepper drive adjusting the position of the alignment table side guide. The paper side guide also has a micro skew adjustment to ensure precise die cut registration down the length of the sheet. RDC-Flex rotary die cutting equipment can be programmed to deliver products in separated batches on the delivery conveyor. Using this feature, the batch quantity and desired number of batches is entered in the touch screen control panel by the operator. As each batch is delivered, the delivery conveyor will "surge" to create a gap between batches. The ability to batch/surge (video) is extremely important for playing card decks and many other products. The RDC-Flex rotary die cutting system can register sheets from the lead edge of the sheet or from a lead edge registration mark. When registering from the lead edge of the sheet, the RDC-Flex will not automatically compensate for up/down imprint registration variations. Using the mark registration mode, the RDC-Flex will automatically compensate for up/down imprint registration variations. The RDC-Flex rotary die cutter has been specifically designed for quick change over between jobs. Removing an existing die and mounting a new die, in an accurately registered position on the magnetic cylinder, is exceptionally quick and easy. The magnetic die cylinder is easily accessed through a hinged, safety interlocked, cover. Jog forward and reverse pushbutton controls are conveniently located to speed and simplify die removal/installation. New dies are accurately positioned on the magnetic cylinder using precision registration pins. Accurate positioning of the die to the magnetic cylinder is critical to eliminate skew errors and to ensure consistent die registration accuracy with stored programs. The unique combination of features incorporated in the RDC-Flex ensure the fastest and most accurate die changeover possible. Inline waste stripping is an absolutely essential feature for any rotary die cutter. The ability to quickly set up the waste stripping section of the machine is equally important, especially when running small quantity orders. The RDC-Flex uses quick change waste stripping assemblies that can be changed in a few seconds, without tools. This is a critical design feature that eliminates the extended down time required while operators manually reconfigure the stripping section used on competitive machines. 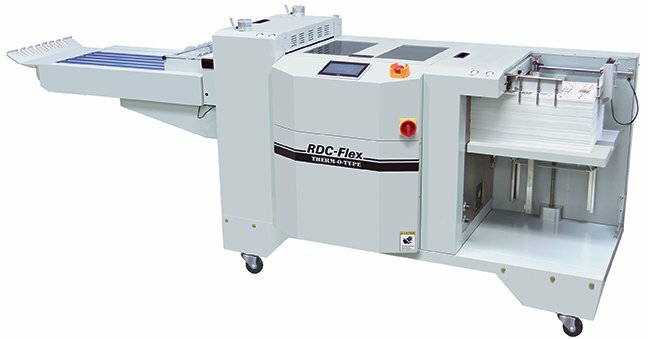 RDC-Flex rotary die cutting equipment uses unique, quick change stripper assemblies. Customers running multiple die cut formats can use multiple pre-configured stripper assemblies to speed and simplify format changeover. Stripping assemblies can be installed/removed very quickly, without tools. Stripping assemblies can be configured with fixed stripper fingers (most common) or with programmable stripper fingers for stripping waste from more complex rotary die cut designs. Stored and retrieved die cutting job set up information includes programmable stripper finger settings. Running large volumes of small/variable quantity orders requires a delivery conveyor long enough for operators to collect and sort individual orders. The variable speed, 48” long delivery conveyor on the RDC-Flex rotary die cutter is ideal for this type of work. Using the batch/surge control, operators can run continuously while batching finished product on the delivery conveyor. This feature is especially important when producing products like playing card decks. Again, the delivery conveyor length is important, providing sufficient time and space for the operator to collect individual orders. Rotary Die Cutter Running Business Cards - THERM-O-TYPE Corp.
RDC-Flex Rotary Die Cutter - Batch Surge by THERM-O-TYPE Corp.
THERM-O-TYPE sells self adhesive ejection foam which is applied to RDC-Flex dies. Ejection foam ensures that die cut products and waste smoothly transition through the die cutting, stripping and delivery sections of the machine.